I'm starting to develop an inadvertent theme on my blog with a review of another African eatery in Edinburgh. Located on Nicholson Street, Knights Kitchen is a little restaurant offering a twist on African cuisine they describe as 'nourishment for the soul'. I had the Knights Kitchen African Breakfast which was an African take on a classic fry up that comically arrives to you straight on the frying pan. This featured your usual bacon, eggs, tomato, avocado and toast, alongside a Boerewors sausage and plantain. Plantain is a common ingredient in African cooking and was the highlight of this meal for me. It provided that perfect amount of sweetness that compliments all the other savoury elements of the dish – and I'm a big fan of that sweet/savoury combination. I'm not too sure how I felt about the Boerewors sausage. It was my first time trying it and I don't think I expected it to taste the way I had imagined. It's quite a dense almost fragrant sausage, I did think it worked really well with the sweetness of the plantain. Normally after a fry up I feel a bit greasy and in need of a food coma induced nap, but this take on breakfast was much lighter and didn't feel like too much of a cheat on the old diet. The décor inside is really unique and fun with wooden booths that resemble little huts, which definitely makes it stand out against other cafes on the street. I went on a Sunday for my usual brunch with my parents and older sister and we were seated in one of the booths. It was actually quite quiet, probably because it was an unseasonably sunny day outside. My only complaint comes from the waiting time between the arrival of my food and my Mum's meal. We had almost finished our plates by the time hers arrived – don't worry, we did try to wait but we didn't want our plantain to get cold! My mum did say her meal was worth the wait. 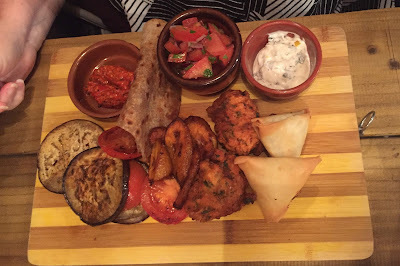 She had the Village Platter for one which contained grilled aubergine and tomato, samosas, bhajias with some different dips and was all vegetarian friendly. In true foodie fashion I had a taste of the samosas and they were really good, packed full of flavour. I would definitely say Knights Kitchen is worth a visit if you're looking for a unique twist to your usual Sunday morning fry-up!